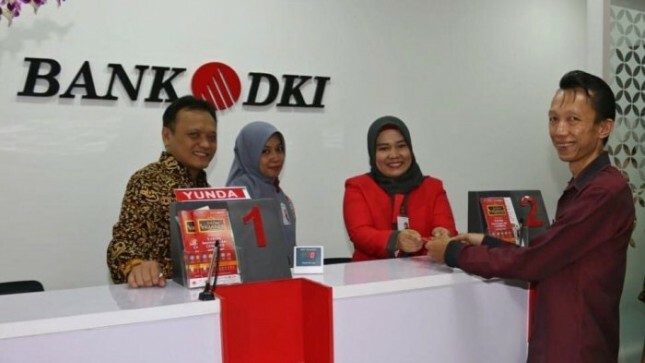 INDUSTRY.co.id - In an effort to realize one of its missions to become the Bank of Choice for the MSME Sector, DKI Bank opened 4 (four) new service offices at the Cash Office level in a number of markets and shopping centers in Jakarta. The inauguration of 4 (four) service offices was conducted centrally at Pasar Baru Bantar Gebang, East Jakarta, which was inaugurated by the Director of Technology & Operations of DKI Bank, Priagung Suprapto in Jakarta (08/30). The four new Cash Offices that were opened at the same time were the Pasar Baru Cash Office Bantar Gebang, East Jakarta, ITC Depok Cash Office, PGC Cililitan Cash Office and Pasar Kasanggan Kranggan Mas Office. DKI Bank's Director of Technology & Operations, Priagung Suprapto said that the selection of 4 Bank DKI service offices is based on DKI Bank's commitment to bringing service coverage closer to MSME players, especially those in market locations in Jakarta and surrounding areas. As of 30 August 2018, the existence of the Bank DKI Service Office in the market has become 75 markets and its surroundings. To be able to facilitate capital for MSME players, Bank DKI has 25, 75 and 500 Micro Monas credit products with a ceiling of Rp. 25 million to Rp. 500 million which can be used as additional access to working capital and investment. Bank DKI also provides daily, weekly or monthly cash pick up services with a mobile collection that aims to provide convenience, because each installment from traders / debtors will have a valid receipt and recorded on the DKI Bank system. Simplifying Regional Tax Revenue Services In an effort to increase the convenience of DKI Jakarta residents in paying local taxes, DKI Bank provides easy payment of Land & Building Taxes / PBB-P2 DKI Jakarta through JakOne Mobile's financial services application. JakOne mobile users only need to enter the Tax Object Number and tax year to be paid. To increase public interest, Bank DKI will give 5 (five) units of motorbikes for free without being drawn to taxpayers who make PBB-P2 DKI Jakarta payments through JakOne Mobile and make the most JakOne Mobile transactions. The UN payment payment applies to all users Jakone Mobile. JakOne Mobile application users can pay PBB-P2 on behalf of other people to join this promo program. Collection of the most transactions starts from the PBB-P2 payment in the DKI Jakarta area for the first time. We also urge the taxpayers to immediately pay the PPB P2 before maturity on September 14, 2018 said Priagung. In addition to receiving PBB payments, Bank DKI can also receive annual motor vehicle tax payments (PKB) for DKI Jakarta anytime and anywhere through JakOne Mobile. Taxpayers only need to enter their KTP number and vehicle police number to be paid through JakOne Mobile. Furthermore, taxpayers can make PKB payments in accordance with the details of the nominal amount of PKB listed. In addition, taxpayers can also make PKB payments through the scan to pay feature on the QR Code available at the SAMSAT DKI Jakarta payment checkout via JakOne Mobile, closed Priagung. PKB payments can also be made through Bank DKI's ATM and EDC machines.